Wash, eat, tie my shoe. So much to share, so much to do. Roll a ball across the floor. Build a box house with a door . . . From books and blocks to pets and boxes, a child's desire to play, explore, and connect is an innate and educational impulse. 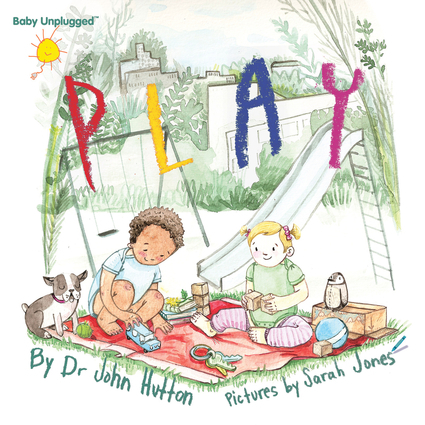 From the award-winning Baby Unplugged series by pediatrician and child development expert Dr. John Hutton, this book emphasizes screen-free, "unplugged" play with multi-sensory everyday objects—no screens, batteries, or WiFi required. Dr. John Hutton is a pediatrician, an author, and the owner of the award-winning blue manatee children’s bookstore in Cincinnati, Ohio. He is the author of Sleep Baby, Safe and Snug and the award-winning Baby Unplugged series and the founder of the blog Baby Unplugged, whose mission is to help keep children screen-free until age three and promote healthy, developmentally stimulating alternatives. Sarah Jones is an artist, an author, and an educator. She regularly exhibits her work in a broad range of venues and holds an MFA from the University of Cincinnati. They both live in Cincinnati, Ohio.